16-year-old Kaia Gerber looks too haggard. So the daughter of Cindy Crawford looked before she started a model career - Kaia was a healthy and blooming girl. Young Kaia Gerber began the career of the model at the age of 14 - the girl from time to time starred for advertising and fashion magazines. But the daughter of supermodel Cindy Crawford started to work hard only now. Kaia is 16 years old, and from that time she can participate in the fashion shows. Recently, the girl debuted at three fashion weeks, which passed one after another - in New York, Milan and Paris. Crawford's daughter is drowning herself in model work - she participated in the shows of Salvin Klein, Chanel, Versace, Saint Laurent and dozens of others. Everyone already predicts her a great future, just as brilliant as her mother's. Only on the last photos Kaia looks so thin that many admirers of a young model suspected anorexia. Paparazzi photographed Kaia in Malibu, where the mansion of Cindy Crawford and her husband, businessman Randy Gerber is located. A young model was walking on the street with her friends. Kaia was dressed in mini-shorts, exposing her legs - thin as canes. The girl was without makeup, and it was especially noticeable that she was tired. Cindy's daughter looks tired and haggard. 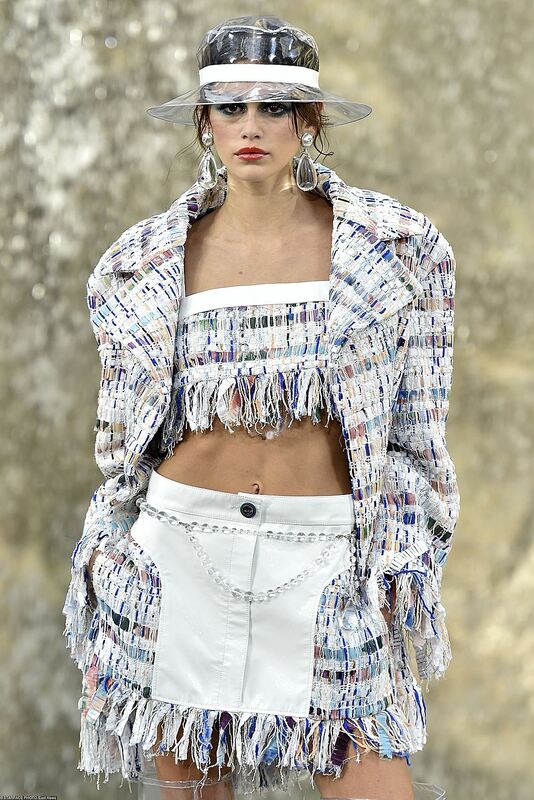 The fact that Kaia has an unhealthy appearance was noticed at the Chanel show during the Paris Fashion Week. This show was one of the last in the tight schedule of the girl, and, apparently, by this time Kaia was completely worn out. Even a layer of make-up could not hide the bruises under the eyes of a 16-year-old mannequin. Fans are sounding the alarm, and they say that Cindy needs to pay attention to the health of her daughter. By the way, Kaia's father Randy Gerber, owner of restaurants and nightclubs, himself a former model, and knows the underside of the model business perfectly. Cindy Crawford herself for a long time discouraged her from starting model career - she did not want Kaia to experience all the difficulties of the modeling business. Cindy began her career only at the age of 20 - by modern standards very late. In addition, Crawford was never as thin as her daughter: the supermodel has repeatedly stressed that over the past years, the standards of beauty on the podium have changed greatly, and the models of her generation would now be considered too fat. "I've never had a figure like a model," Cindy said. - Even when in the fashion were healthy girls of the size 6, my curves were more magnificent. Now the models are getting thinner, and the size range is smaller. But I'm not going to fit into these standards. It does not matter how confident you are, but when you are given pants that you do not fit into, you feel terrible. Cindy often repeated to her daughter: "The attractiveness of the model is not in her thinness, but in her individuality, her ability to be herself." But the fashion industry now makes such tough demands on mannequins, and competition on the podium is so great that girls have to literally starve themselves, just to be successful and in demand. Even though Kaia Gerber was born with a silver spoon in her mouth, and she did not have to pave the way to the catwalk from the very bottom, as other novice models, the girl still has to obey the dictates of fashion business.